3D scanners are less popular than 3D printers, but they are an important part of the 3D printing ecosystem. Many different types of 3D scanners exist, from desktop 3D scanners to handheld 3D scanners and advanced metrology systems. This translates into a sturdy selection, although some great 3D scanners that are new on the market may not have a place in this list. Industrial 3D scanners are also out of the picture due to the price limit. Note: we strive to provide a comprehensive overview of the market. However, in completion of our lists and product pages, we still recommend searching for additional information. There’s plenty to go around in 3D scanning forums and discussion groups. This table represents our selection of the best 3D scanners available in 2019, with a focus on consumer-grade and professional 3D scanners. 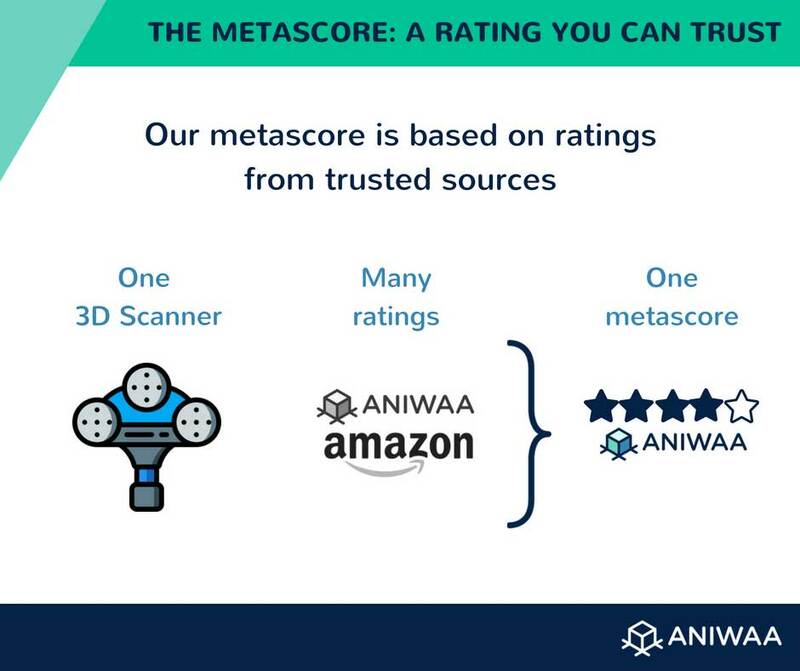 *Metascore: we calculate product metascores based on reviews from four reliable sources (Amazon, 3D Hubs, Pinshape and Make:). However, in this ranking the reviews mainly come from Amazon and our own internal testing. *Price (MSRP): manufacturer suggested retail price. These prices are subject to change over time and/or depending on users’ location (import taxes). Tip: get a full overview of the 3D scanners market with our 3D scanner comparison engine. The David SLS-2 is the workhorse of desktop 3D scanners. We aggregate reviews from four reliable sources (Amazon, 3D Hubs, Pinshape and Make:) and with the ratings from our own tests. This creates a metascore, which we use to create our lists of the best products. For 3D scanners, there are much less reliable review sources than for 3D printers. Therefore, for this list, we focus mostly on Amazon and Aniwaa reviews. 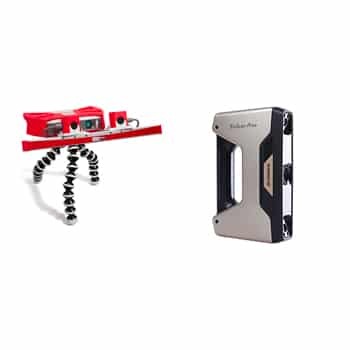 To build this list, we selected 3D scanners available on the market. The availability depends on the brand and the product. We selected 3D scanners that seem to have an active online community. We realize that this point is subjective, and that it is hard to evaluate wether a brand is reliable or not. However, as 3D professionals we spend time scrolling through the internet and get feedback from users and partners. We then summarize these observations into keynotes. Opinions may change over time and not everyone has the same point of view, so even with our summaries we still recommend looking for information in Facebook groups, Google+ circles, proprietary brand forums, Reddit, etc. To start, you can read our best 3D printing and 3D scanning forums article. 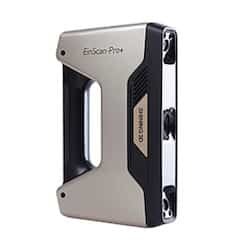 The EinScan-Pro is a handheld 3D scanner designed by Shining 3D, a manufacturer based in China. This multi-functional portable 3D scanner is a game changer in the world of handheld 3D scanners. It is versatile, light and easy to operate. By far, the Einscan Pro offers among the best price to performance ratio for portable 3D scanners. Color capture is available as an option, via an external texture camera which can be attached to the EinScan Pro, to capture objects in 3D with full colors and texture. No wonder this handheld 3D scanner is a best-seller! 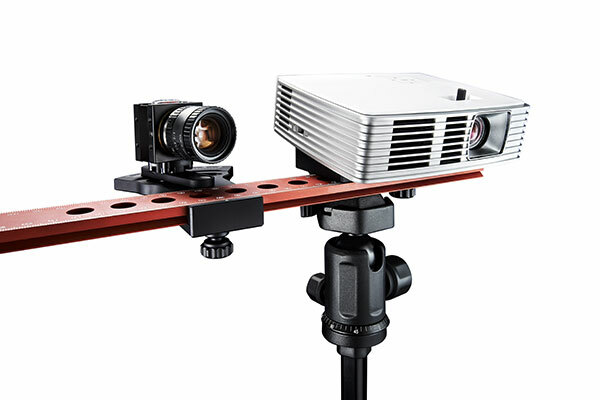 The EinScan-Pro+ is a portable 3D scanner designed by Shining 3D, a manufacturer based in China. 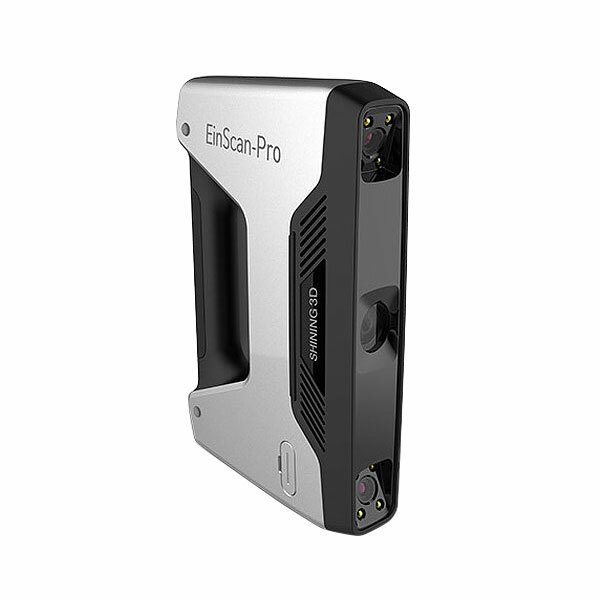 The main new features of the EinScan-Pro+ and differences with the EinScan-Pro are: a new HD capture mode, a larger 3D scanning area, a rapid acquisition module for faster 3D capture. The Shining 3D EinScan-Pro+ uses a white structured light 3D scanning technology, based on LED lighting. Outdoor use is not recommended as the structured light is affected by the sun, even under cloudy weather. The EinScan-Pro+ is delivered with the latest version of the EinScan software. 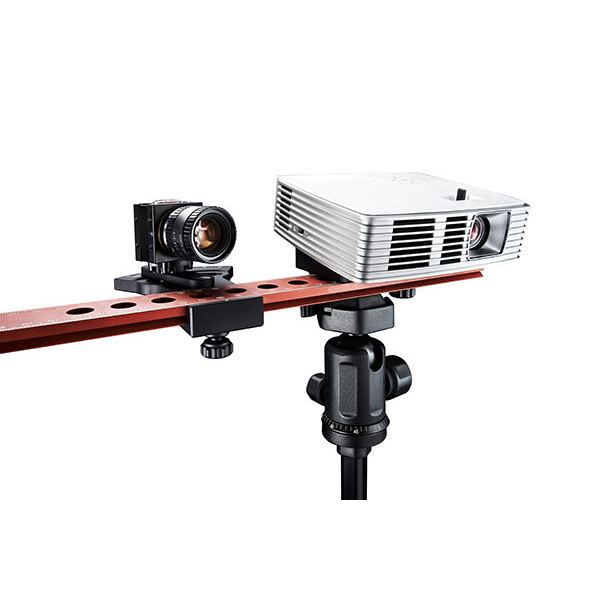 The RangeVision Smart is a professional 3D scanner made by RangeVision, a Russian manufacturer. This 3D scanner fits a variety of applications, such as: education, 3D services, art and sculpture, reverse engineering and industrial design. The RangeVision Smart can support options such as, an automatic turntable for scanning of small objects (for example jewels), a blue light filter (allowing to 3D scan even in difficult situations) and a protective case. The DAVID Structured Light Scanner SLS-2 is well-known desktop 3D scanner, often among the top-rated 3D scanners on the market. The DAVID SLS-2 scanner comes with a HD Video projector offering a large focus range and stable glass calibration panels. The 3D scans can be exported into common 3D file formats (OBJ, STL, PLY) and used in a variety of fields such as rapid prototyping/3D printing, inspection, reverse engineering, archeology/cultural heritage, works of art, computer animations/CGI, or video games. A workhorse among desktop 3D scanners! Which 3D scanner is the best for me? 3D scanning small objects, dentists, jewelers and other professionals can use 3D scanning to capture small pieces. 3D scanning big objects, professionals such as architects and archeologues might need to 3D scan large objects such as statues, archeological fields or buildings. 3D body scanning, is getting increasingly used in various professional fields such as healthcare and 3D figurines making. Read more on our 3D body scanning page. 3D scanning objects occasionally: a person might need to use 3D scanning on rare occasions or maybe just one time. 3D scanning objects on a regular basis: individuals can use 3D scanning for various things from making personalized objects to 3D scan themselves to make memories. 3D scanned ring (source: protoforming). The recommended 3D scanner will change depending on the dimensions and the distance of the object to be 3D scanned. A desktop 3D scanner can’t 3D scan a 2-meter-tall statue, and a handheld 3D scanner might not be the best option to 3D scan a very small and precise piece. Not every 3D scanner is able to capture the attributes of an object’s surface, such as color and texture. All 3D scanners do not offer the same resolution capacity. Therefore, depending on the wished quality result, some 3D scanner models are more adapted than others. Desktop 3D scanners can be destined to professionals and individuals willing to capture a small piece in 3D. Handheld or portable 3D scanners can be used to 3D scan small to very large pieces. Those 3D scanners can also be used to reach places that are difficult to access. The precision and the ability to capture color and texture will depend on the 3D scanner model. 3D body scanners can be used in very various fields. Professionals: professionals might want to 3D scan a person to make a 3D figurine, prepare for a surgical intervention, etc. Individuals: 3D body scanners can be used to help with fitness goals and personal shape. Those 3D scanners usually can’t capture color and texture but have a high resolution. 3D scanning mobile apps are designed for occasional users that are not willing to invest in a 3D scanner. They are not as precise as most 3D scanners, but mobile apps are a great way to get initiated to 3D scanning. Read our blog post to discover the five best and free 3D scanning mobile apps. Desktop 3D scanners prices change a lot from one model to the other. It can go from a few hundreds dollars, such as the bq Ciclop at $240, to reach prices up to $15k for the more advanced ones. 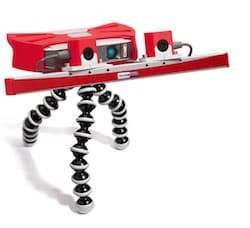 The handheld or portable 3D scanner price range is very wide, starting at less than a thousand dollars with for example the Occipital’s Structure Sensor at $379, to reach astronomical prices of over a $100k for very high end and advanced 3D scanners. Industrial 3D scanners generally offer more cutting-edge features and higher precision, therefore their prices can be pretty high, ranging from $1k for the simplest ones to more than $100k for the most evolved ones. 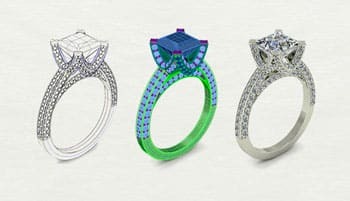 Jewelers are starting to use 3D printing and 3D scanning to build casts in order to create amazing jewels. Read more on our 3D printing and 3D scanning for jewelry page. 3D scanners are very versatile and can be used in many different ways in healthcare, from studies to making prosthetics or studying a person’s posture. Find more informations on our 3D scanning and 3D printing for the medical industry page. 3D scanning for the dental industry (source: ResearchGate). 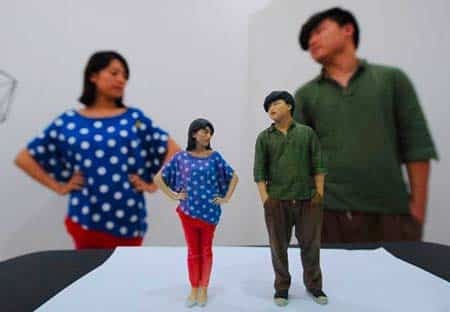 3D scanners can be used to make 3D figurines (source: 3Dprinting.com). 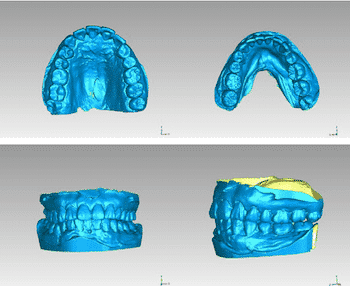 Dentists and dental labs are using 3D printing to build and create various dental appliances. Find more information on our 3D printing and 3D scanning for the dental industry. 3D portraits or mini-me are hot right now! To make them, a person gets 3D scanned and a figurine will be 3D printed looking just like the subject. To learn more about the subject, you can visit our 3D printed figurines, 3D selfies and 3D portraits page. Note: interested in opening a 3D selfie business? Contact-us to receive more information and a free quote. Architects can use 3D scanning to capture an area, building or habitation and present it in a more efficient way to their clients. If you are interested, you’ll find more information on our 3D scanning and 3D printing for architects page. Archaeologists, museum curators and researchers are starting to use 3D scanning to get a better view and capture ancient pieces. To read more about this topic, you can visit our 3D printing and 3D scanning in archeology and cultural preservation page. 3D scanning for architecture (source: Wired). 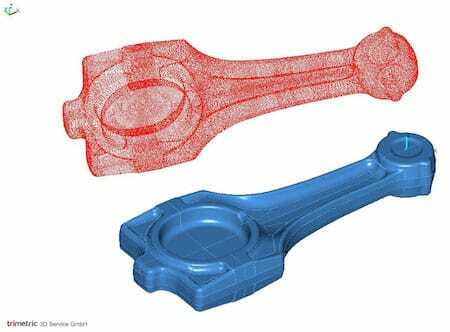 3D scanner can be used in reverse engineering (source: trimetric). Reverse engineering, also known as back engineering, is the process of extracting information of anything man-made and studying it. 3D scanners can be used to capture all the parts of an object being dismounted to create a 3D model which the user will be able to digitally manipulate in 3D after. Industries need to make sure their factories are producing perfect products, perfectly respecting the dimensions of the product blueprints. 3D scanners can be used to rapidly and efficiently take those measurements. 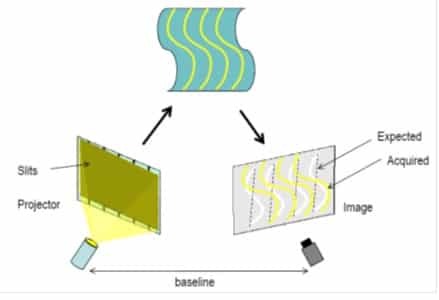 Structured light 3D scanning technology (source: Depth Biomecanics). Photogrammetry consists of taking measurements from photographs to recover the exact positions of surface points. 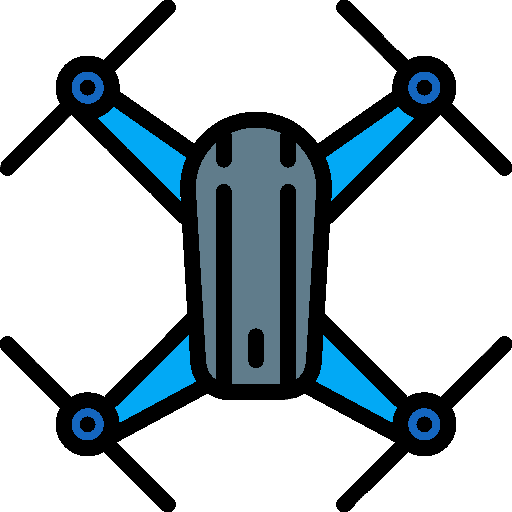 The principle of photogrammetry is to analyze several photographs of a static subject, taken from different viewpoints, and to automatically detect pixels corresponding to a same physical point. 3D scanners using structured light projects a serie of light linear pattern onto an object. 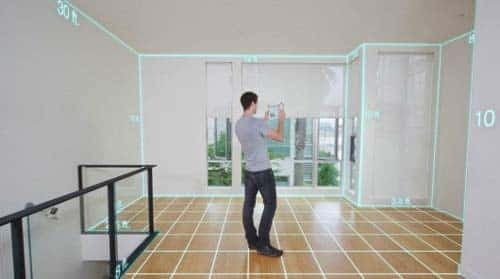 The system is then able to examine the edges of each line and to calculate the distance from the 3D scanner and the object’s surface and build an accurate 3D model out of it. 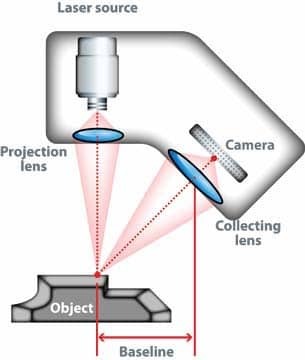 A 3D scanner using triangulation will project a laser beam on the object’s surface and measures the deformation of the laser ray. Contact 3D scanners probe the subject through physical touch, while the object is firmly hold in place. A touching probe is moved on the surface to various points of the object to record 3D information. To have more precise and detailed informations, you can visit our 3D scanning technologies page. 3D scanning laser triangulation (source: NeoMetrix). Do you want to compare all existing 3D scanners? Check out our 3D scanners comparison engine, we have more than 250 3D scanners listed. Overall, what’s the best 3D printer on the market? Find out with out ranking of the best 3D printers. On a budget? Here are 15 cheap 3D printers under $1,000.